Creo God Simulator is a game of building, decision-making, survival, and a ton of peasant smiting. As a newly-assigned lesser god, it's your job to build a society bit by bit, while convincing your new population to believe in you as their one true god. During your time as a god, you will discover new powers to use and more advanced buildings to place, but beware, as you progress, the randomized events generated by the AI enemy gods become more difficult. Can you beat the enemy gods and prove yourself as the one true god, or will you slowly fade from the memory of the people you created? This is the early access version for Creo God Simulator. If you like what you see, feel free to join our Discord Community and let your voice be heard in the game's development. Also, make sure to follow our Mixer Channel for weekly updates and videos! Found some bugs? Join our Discord Community and let me know! 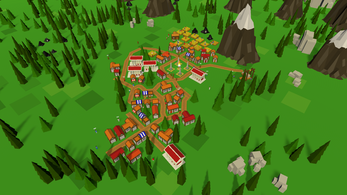 An interesting take on resource management and world building games. I'd love to see this expand from a small town to and empire to eventually being able to conquer the whole world! I see a lot of potential in this game and had a lot of fun playing around with all the different features (and smiting villagers that annoyed me). I made a game play video for the game and if you got the chance to check it out I'd really appreciate it! Keep up the great work! Hey Simtasia! Thank you so much for reviewing my game, I love your video by the way. I've made quite a bit of progress on Creo on the new update since the current available version. I'd love to get your feedback on future versions. Feel free to join our discord and stay updated on new developments. Thanks again! Deselection: I'm not sure if I have seen this error before, and I can't seem to replicate it. Could you hop on our discord server and state the error in more detail for me to fix? Road tool: I will admit it is a bit buggy, and there are times where it doesn't work. It especially doesn't seem to like vertical road placement haha. So if this is the case, I'd recommend rotating the camera for now. Thanks for you feedback EyesCream! I look forward to seeing you in the discord server! Thanks! I really appreciate you saying that. If you have any suggestions on how I can improve the game, or would like to stay informed on current progress, feel free to join our discord! Greetings! I really like the look of this game. It's an interesting blend of ideas from other town builders and god games, and I could see it getting really fun. I have noticed that Creo uses free audio, though. Are you intending to replace this with custom-composed music and sound effects as the project progresses? If so, and if you're looking for a composer, I would be very interested in helping with that. I don't really have anything super-close to Daniel Birch's style to show, if that's a sound you want to stick to (it certainly fits nicely! ), but I could definitely adhere to an understated, relaxing, synth-pad-heavy tone like that. Or, if you wish, add in a few folksy elements to bring it towards something like Age of Empires, or orchestral, for a slightly more RPGish flavour. I would of course work with you closely to make sure the music and sound effects are exactly what you want. As I started to play I couldn't get very far because I ran out of food.This is because when I built farms they were quickly over run by locusts and this was on easy. Best thing to do is use your will power to grow the crops by producing rain. This will increase your food resources for a time, but it will eventually decrease. Best thing you can do is play the market with what resources you have, what you have in abundance sell and what you don't buy. This game need some major improvements. First, there needs to be a "speed up time" feature in the game because waiting around for resources gets boring after a while and with most sim city game, they have this feature to allow the players to speed up time and keep them entertained. No one wants to wait around in a game for resources. Thirdly, the randomly generated buildings need to be changed. What I mean is that you can have a building that is one by one or a building three by three but they both do the same job. Instead of random buildings, have it so that the buildings either changed according to upgrades or have it so the player can pick the building out of the diferent varieties of building there is because having these building give the player much more variety on what they can place and allows other to make the most out of the space they have. Fifth, there needs to be some incentive for the player to keep coming back. Mini objectives like having the player to complete challenges for a reward or a unlockable sandbox mode or even a story mode can keep the player engaged in the game. Small changes like this can be a major improvement and engagement is always good. Sixth, maybe add some mod support. Most city building games have mod support to allow the game to be fresh and to allow the community get involved in the game and engage more in the game. This is probably a later feature you want to add but its not that important. Seventh, I know you are trying to go for the "free-form" feature to city building but I think this feature needs to be changed to a snap and grid system so that players can make the most out of the land they have. This is more of a personal preference than anything else so if you have done all of the above then this doesn't really matter. But please let me snap my roads to each other. I hate wonky roads. I would aloow the player to decide whether to use the snap feature or not so have it on a toggle in either the options menu or on the HUD for easier accessability. It just allows for more of a variety to the game. If these changes took place then it would have a lot of potential to be a good city building survival game. I tried not to go too hard on the game but I feel like you could use some ideas of how city building games work. If you want to look at a game that is similar to yours then either look at frostpunk or universim for inspiration. Good luck on your journey and I go into more detail in my video. for future development. And trust me, I know city building and god games—I've played them my whole life haha. I've got lots of ideas, the only thing I don't have too much of is time. Each one of the systems mentioned takes hours and hours to code and implement. know if you have any additional suggestions! Thanks for the reply on my comment. Its good to see a developer take the communities feedback so well. I hope everything goes well for you and for the game. Hopefully the final product will be fantastic and can't wait to see it completed in the future. Good luck on the game. It seems from the video up top that there is only Ancient Greek or Roman buildings or maybe Egyptian. Can you try to put in more variety in types of buildings? Hey Chris! Feel free to join our Discord community and let us know what kind of buildings you would like to see! Way to little resources at the start. You should start with enough resources to get all the basic buildings. This needs a sandbox mode, like as a hidden / unlockable / reward. Can't wait to see it finihed!!! I think that's a great idea as a sort of end-game reward! I'll have to see if that's a possibility in the future! Sounds great! Hop on our discord and let me know what you think! Been working really hard on another lets play video. This one will showcase the destruction of bad decisions. Really like how you applied well system to being so detrimental if not taken seriously. Video should be up by tonight. Hope you like it, keep those updates coming and I will keep the lets plays going. Looking forward to it! Planning on another large update here in the next few days as well. An economy trade system in addition to what's in. You might consider holding off for now until that release! I made sure to tag the version it is. This was more of a dramatic fire episode, but I will also do a lets play of the economy trade system when you have that update up. i loved the game but unfortunately i was impatient to see all the powers and wondering any places with the game? Hey DizzYgaming! Love your video! I wasn't able understand your question, could you clarify a bit? I'd love to answer any questions you might have. ope my bad! i was wondering if there other God power other than meteor and rain? Oh of course! I'm planning on at least 10, most likely more. In fact, members of my discord server get to actually help me pick and create which God Powers get included, so feel free to hop on and share! Also, a much improved version has been uploaded—I'd love to get your input on it. Nice ill take another look at it! This game has no water so according to IGN that makes it a 10/10 awesome. You should play it.